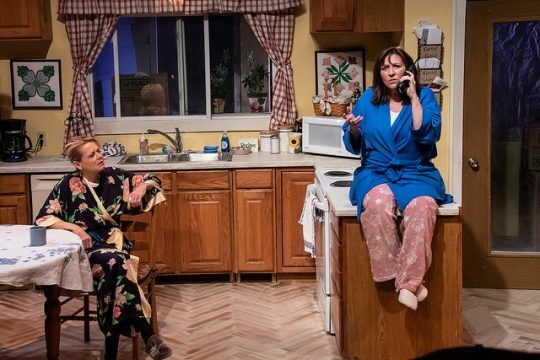 While watching the excellent portrayals of Ellen Phelps as Sharon and Laurie Carter Rose as Robyn, in Citadel Theatre’s “The Roommate, you may not agree with all their choices but you clearly get the message that they are seeking ways to begin their lives anew. A dark comedy, “The Roommate” brings together a recently divorced Iowan housewife searching for company and a way to split the bills and a lesbian, former Brooklyn con artist who really seems to want to escape her past in a small-town, farming community. Their seemingly simple plans go awry as Sharon becomes interested in Robyn’s former life and Robyn realizes she may be a dangerously corrupting influence. In addition, both women seem to have alienated their adult children. Neither Sharon’s son nor Robyn’s daughter want to call Mom until they realize through their parent’s strange, long distance calls that something is changing. Even though I had seen the play and enjoyed it at Steppenwolf last year, I was appreciating the show once again until the last line which I objected to then and still do. Depressed by her once again empty house because Robyn leaves, Sharon first says, “I don’t know where to start…. Except over again” Fine. The play should have ended there. Perceptively directed by Beth Wolf and staged on a believable, well-designed set by Eric Luchen, “The Roommate” offers a somewhat exaggerated but fun and interesting “what if” scenario on life when people reach middle age and wonder what should come next. “The Roommate” is at Citadel Theatre, 300 S. Waukegan Rd., in a Lake Forest School District building, through March 3, 2019. Running time: 90 min., no intermission. For tickets and other information call (847) 735-8554, ext. 1 or visit Citadel Theatre. What can happen when a lonely, middle-aged woman takes in a roommate for companionship and to share expenses? In playwright Jen Silverman’s “The Roommate,” now at Steppenwolf Theatre, the answers are surprising and problematic. Adeptly directed by Phylicia Rashad to achieve the highest impact possible during the 90 minute show, “The Roommate” transforms Sharon, an uptight, judgmental, highly moral, 50-something, empty-nester into an amoral woman willing to try anything. 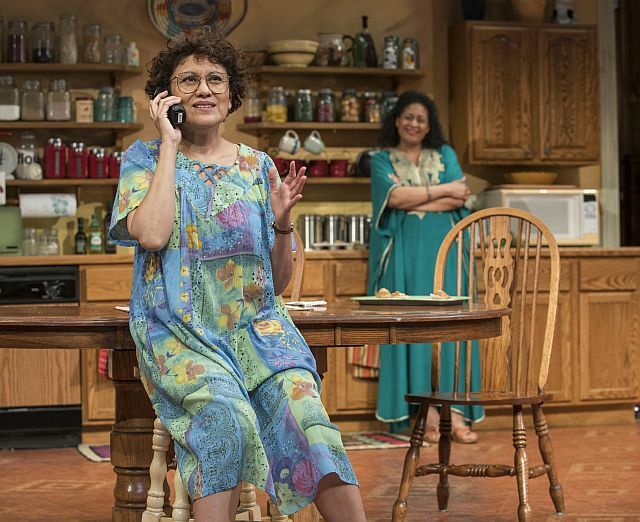 The setting, perfectly depicted by scenic designer John Lacovelli, is Sharon’s kitchen in her large, old Iowa City home. The catalyst for change is Robyn, another 50-something empty-nester from the Bronx, who, in photography terms, turns out to be the negative of Sharon.